Upma is to South Indians what cereal is to Americans – a breakfast staple. My relationship with Upma for the most part of my life had been a hate-hate one. It slowly changed to being a love-hate note during my college days when I stepped out of home and longed for home cooked meals. No points for guessing what I am about to say now. As you might have expected, finally I can say it now sings a love-love tone. I guess each of us have a certain food or a list of them that we go through phases with. Undoubtedly, Upma tops that list of mine. I have an explanation for that. For the ease of making it or for even simpler reason that Upma making ran on an autopilot mode in my Grand dad’s place growing up, Upma showed up on my plate more often than I would have liked, consistently throughout all my school years. Needless to say, that made me sick and tired of eating it day in and day out and did I mention the lunch boxes? Familiarity bred contempt and Upma almost turned to be my arch rival. Being far away from home does wonderful things to quite a many fussy eaters, not that I am proud to call myself one! I often catch myself yearning for Upma which, now has taken that special place of special weekend breakfasts and sometimes a quick (lazy) brunch too.. There are a myriad variations of Upma for every local flavor, city, regional influence et al. This recipe in particular is borrowed from my aunt Va, ‘cos each time she made it I only remember licking to my last finger. Finishing off with the grated carrot goodness is borrowed from my good friend DM. I did not forget. Yes, it is yet another weapon of sneaking vegetables for my fussy pre-schooler. In a medium kadai / heavy bottom saucepan over medium heat, dry roast the rava until fragrant or for about 10 -15 mins. Remove rava on to a plate and keep aside. Optionally, microwave rava spread on a microwave safe plate for about 2 mins at 1 min intervals. Add oil to the same kadai /saucepan placed over high heat. When the oil is hot enough, add mustard seeds. When they start spluttering, reduce heat to medium and add green chillies, hing, chana dal, urad dal, curry leaves and lastly turmeric in the same order. When the lentils turn golden brown, chillies show white spots, add onion and sauté until translucent. Add potatoes, stir well and cook covered until potatoes are tender. To this, add peas, grated coconut and salt and stir well. Add water and bring it to a boil. Adjust salt if required now. When the water comes to a rolling boil, reduce heat to low and add roasted rava to the kadai stirring simultaneously to avoid lumps. Mash to get rid of lumps, if any and when no more lumps remain, simmer covered for 5-10 mins. Sprinkle grated carrots, squeeze lemon juice and stir to mix well. Serve hot garnished with chopped cilantro with a side of pickle and/or yogurt. Do the tempering in a kadai as explained in “How it’s done” with the listed ingredients here. Make sure that curry leaves turn crumbly crisp. To this tempering, add roasted rava, salt and optionally dried onion flakes and dried cilantro and sauté for a few mins to mix well. Remove on to a large plate and let cool. Store in an airtight container when cooled and use within 2-3 weeks. In a sauce pan, bring 1-3/4 times the water (e.g. 1 cup rava needs 1-3/4 cup water) to a boil. 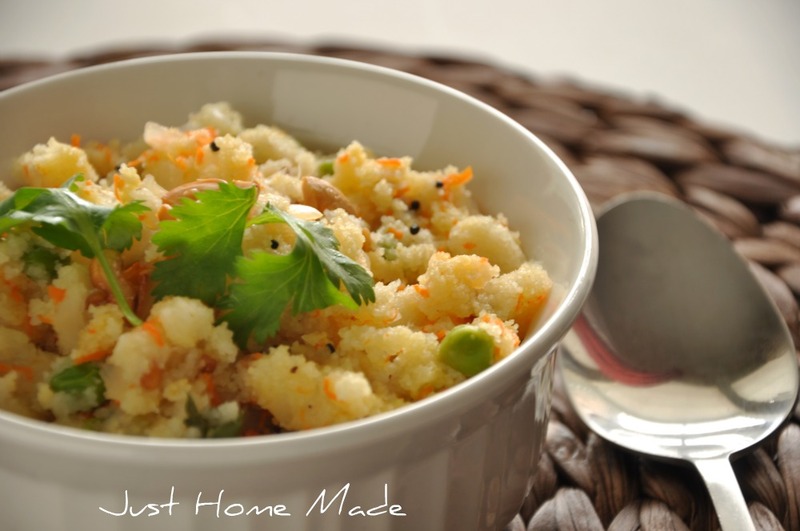 Reduce heat and add instant upma mix and cook along the lines of regular Upma. To hasten the cooking, you can optionally heat the water in a separate pot and keep ready instead of adding cold/room temperature water. Rava can be pre-roasted in larger quantities and stores well in an airtight container for up to a couple of months at room temperature – saves time and makes upma easier. Upma simply stands for [Uppu + Maavu](Tamil) => Salt + Flour. Bansi Rava, Chiroti Rava, Sooji Rava, Semolina, Cream of wheat – What are they? Which is the right one and how do I know? Based on the texture (milling grade) and the type of wheat, different kinds of Rava are available in Indian Stores – coarse and yellowish, medium fine & off-white and superfine & off-white are some I am familiar with. 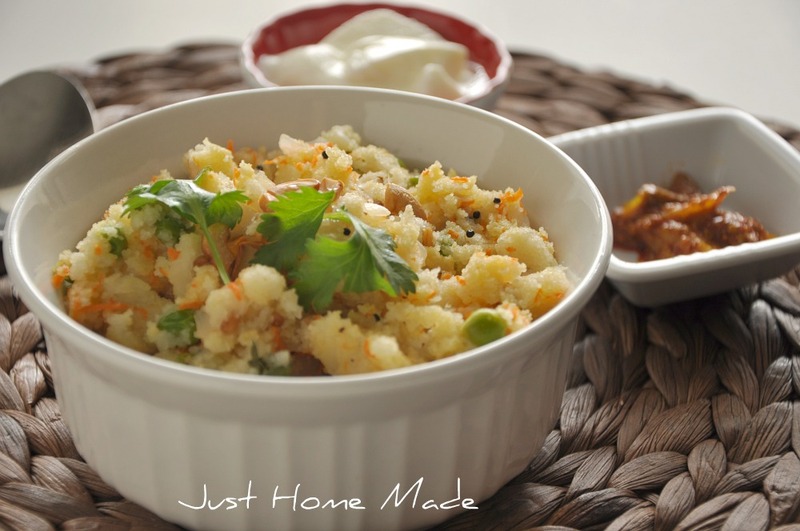 The medium fine off white rava works well for this upma recipe. In general, both the coarse (aka Bansi rava) and medium fine varieties are used for making upma. The superfine variety also known as chiroti rava in and around Bangalore and Mysore is mostly used in making sweets and Rava Dosa. In Indian market parlance, Semolina and Cream of wheat are used interchangeably. However, it seems here in the US, both have different meanings. For more info check http://en.wikipedia.org/wiki/Semolina and Semolina v/s Cracked Wheat. Simply put, both Semolina and Cream of wheat are refined grainy products of milling wheat (the inner part of it). They are stripped off the fiber / husk and for the same reason, quick to cook as well. Semolina which comes from Durum wheat is yellowish in color and other off-white varieties come from softer types of wheat. 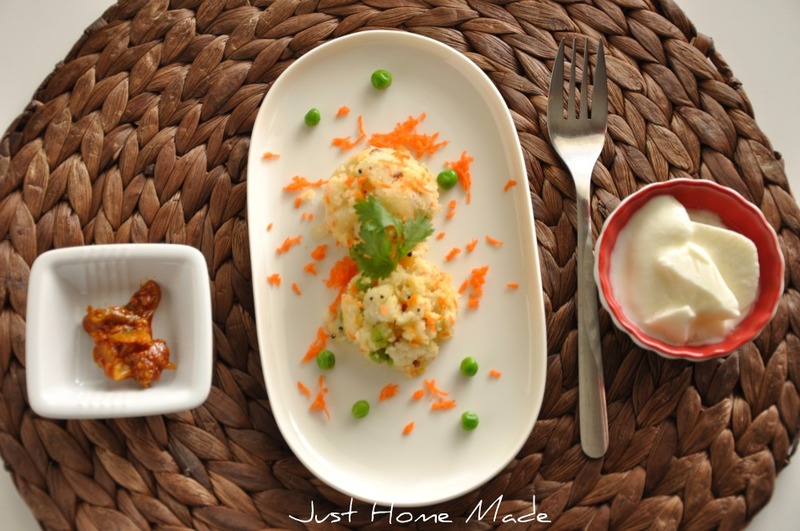 Highly impressed with the receipe for instant upma! Hats off to your creative way of providing quick healthy food. Thanks for tips on Instant Upama mix. Easy to make for breakfast. Other day, i tried Pumpkin Pie and it turned out really well. Wow, this recipe is fantastic. Love how its made from Cream of Wheat! Yum! This is a fantastic dish Radhika ! Its so healthy and you have presented the upma so nicely. Just checked it out, and my husband ordered upma in the sunday breakfast…great job as always ! Manjusha – Thank you for your kindest words..
Varsha – So good to hear you made it! Veena – Guess one hate-hate per family is the accepted norm..Not too long back, I was part of that statistic! Got to try so many of your recipes! Grape Ambrosia & Coconut Cashew Quinoa are top on that list..
Yum, yum, yum! I’ve always had a love-love relationship with upma. When I was a kid and I heard the story of Goldilocks and the Three Bears, I always thought they were eating upma for their porridge! And the “too cold” porridge made me think of my little brother, who sometimes didn’t finish his plate of upma, and so I would do it for him and it would be cold by that point. But still very yummy. My mum used to make it with peas, and then serve it with carrot rayita. And I would mix it together so it was soft and creamy and just the way I imagined Mama, Papa, and Baby Bear eating it. I’ve never made it with potato before- I will have to try that. Thank you for sharing. Radhika – I would like to meet you- I think you are doing a fantastic job. Please email me on gayatri1474@yahoo.com. Gayatri, Thank you so much! Thank you – your Carrot creme soup with coconut creme and sweet chili recipe sounds so delicious! 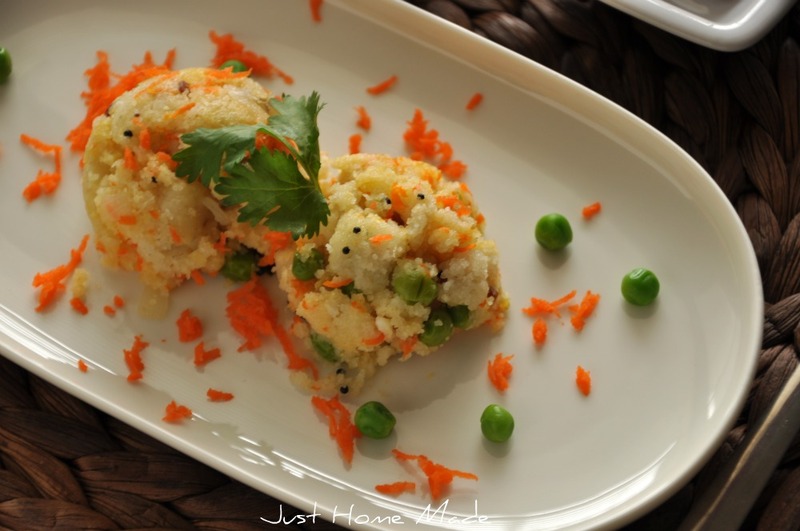 You have changed the way I look at Upma now on! That’s a fantastic story – I could definitely use with my pre-schooler to bribe some Upma. Read your ‘About’ – Totally liked your style of writing, sort of Alice in the wonderland.. Thank You. I am glad to have learnt a Tagalog word “Ang Sarap”. I am amazed at the variety of cuisines you have dabbled in!